1. Place top oven rack in center position and pre-heat oven to 375°F. 2. Heat one tablespoon olive oil in a large, ovenproof skillet or sauté pan over medium-high heat. Add diced onion and garlic and cook, stirring occasionally, until the onion is soft and fragrant, around 4-5 minutes. 4. With a sharp knife, carefully make a slit through the center of each pork chop to form a pocket. Do not cut all the way through. Divide the apple-rosemary filling between the 4 pork chops and secure the openings with toothpicks to hold the stuffing inside. 5. Return the skillet to medium-high heat and add remaining olive oil. Sear the pork chops on both sides until golden brown, around 3-4 minutes per side. Season with additional salt and black pepper, if desired. 6. Transfer the skillet with the pork chops to the pre-heated oven and roast until the pork chops are cooked through, around 15-20 minutes or until an instant read thermometer inserted in the center reads 145°F. 7. 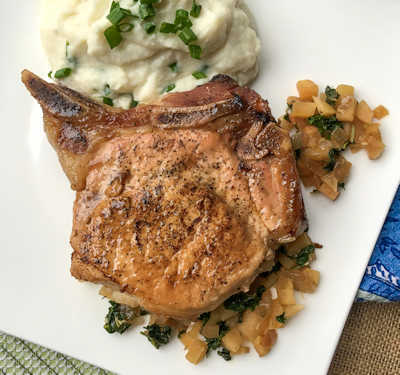 Allow pork chops to rest for 3-5 minutes before serving.